These retired grapevines have brought joy to generations of wine drinkers. Though their winemaking days are behind them, their distinctive character lasts on. Decades of careful cultivation combined with the vines natural tendency to create their own whimsical chaos yields striking compositions. With some careful shaping and finishing, each piece becomes a work of art suitable for warming the heart of a true wine lover. This Rectangle Dining Table is only standard in height. It has remarkable movement in each piece drawing the eye upwards. Decades of wine producing have aged this wood with all the striations of color from drawing the rich nutrients from the soil. Each piece is carefully built to highlight the dynamic colors of the vine. These giant vines were planted between 1907-1911 and were making wine during prohibition. The Italian family that was growing these had several hot rod cars used to elude the police and sold their ""grape Juice"" from San Diego to San Fransisco. After prohibition, they started selling their excess grapes to Mondavi, Gallo, and other wine families who were just starting out developing the wine industry into what it is today. Is the base available without the top and how much if so? Is it possible to get a larger size? We are looking for a 12-14 foot table. We are open for just getting a couple of the bases and ordering the glass ourselves...or if you can provide that large of a piece of glass? BEST ANSWER: Perhaps there may be a special order available for your request . BEST ANSWER: The Grapevine Dining Table Glass Rectangle (42x72) weighs 125 lbs. What chairs do you recommend to go with this table? BEST ANSWER: A simple style would work be best. What is the glass thickness? BEST ANSWER: The Grapevine Dining Table Glass Rectangle (42 X 72) has a glass top that is 1/2 inch thick. We can also offer a 3/4 inch thick glass top. Please contact our sales department at 800.356.8466 for more information regarding this. Thank you. Will you sell the base separately? How much? BEST ANSWER: I believe we can. I have a call into the vendor and will contact you with the answer. HOw thick is the glass top? Is there room for chairs to be pushed in under table? BEST ANSWER: The Grapevine Dining Table Glass Rectangle (42 X 72) has a glass top that is 1/2 inch thick. We can also offer a 3/4 inch thick glass top. Please contact our sales department at 800.356.8466 for more information regarding this. There is enough room for chairs to be pushed in under the table, although if you decide to use chairs with armrests, make sure they fit underneath the glass tabletop. Where is the manufacturer of this gorgeous dining room table/grapevine base? What is the thickness and bevel of the glass? Could the glass be cut as an oval? BEST ANSWER: Thank you for your question, the glass is 1/2" thick, 1" beveled edge, tempered, 1" radius corners. The glass is only available in the shape as shown. Can this be used outdoors as a patio table (mild California climate)? BEST ANSWER: We do not recommend using this outdoors. The Grapevine Dining table glass rectangle (42 x 72). The specifications say Dimensions: 29" H X 24" W X 48" L. Which is it for $4600? 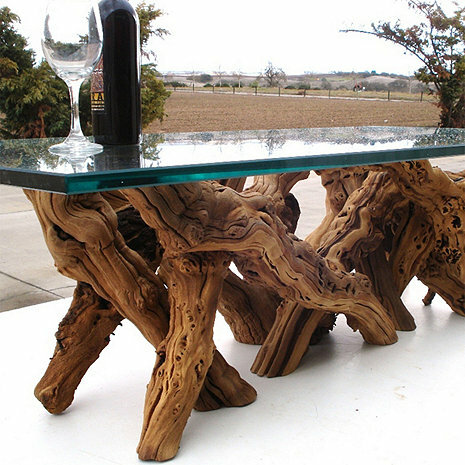 Can these driftwood tables be kept outside?